Few pet topics generate such heated debate as whether or not you should let your dog eat chicken bones. Some people say it's natural for dogs to eat these bones; others say they're a medical emergency waiting to happen. Who's right? Dogs are scavengers at heart, and they will quickly swipe a chicken bone out of the trash bin or even off your plate if they get an opportunity. If your dog accidentally eats a chicken bone, watch him closely for any signs of distress. Does the dog hack as though he has something caught in his throat? Does his abdomen look bloated? Is he straining to pass a stool? Do you see any rectal bleeding or blood in his stools? Call your vet right away if your dog displays any of these signs. Your pet may need an x-ray to determine if one or more pieces of bone are causing a serious problem that requires medical intervention. 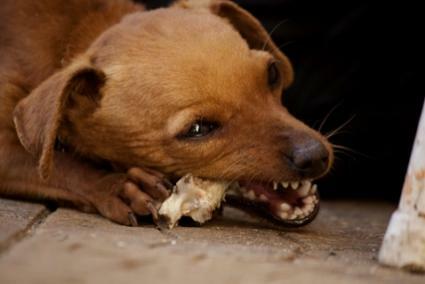 It should first be noted that there is a significant difference between feeding a dog raw chicken bones or cooked bones. Raw bones are somewhat flexible, and dogs are usually able to grind them down small enough to be digested without much difficulty. After cooking, chicken bones become dry and brittle, and they tend to splinter as a dog tries to chew them. That's usually where the trouble comes in. According to veterinary surgeon Tom Lonsdale, eating raw bones is natural for dogs. Raw chicken bones contain valuable nutrients that a dog can use, and Lonsdale believes raw, meaty bones should be the bulk of a dog's diet. Raw chicken, including the bones, is a staple of the healthy raw diet that some owners provide their pets. The carcasses of low-fat game animals, like chickens, provides some of the best food for meat eaters like dogs. According to the FDA, which issued and advisory against feeding all bones in 2010, the possible risks outweigh the advantages of feeding bones, and this includes chicken bones. Sharp bones can cause injury to a dog's mouth. The bones can become stuck as the fragments are swallowed. They can cause constipation and even obstructions along the digestive tract. They can cause rectal bleeding. They can cause punctures that can lead to peritonitis, a bacterial infection that can be deadly and requires emergency treatment. The controversy over whether or not it's safe to feed chicken bones to dogs will likely remain lively for a long time to come, so owners need to make their own decision about what to feed their pets. Keep in mind that everything you feed your dog has the potential to become hazardous under the right conditions. Dogs can choke on kibble, rawhide chews can cause intestinal blockages, and some chemicals used as preservatives in commercial pet foods are suspected of being cancer-causing agents. As an owner, all you can do is weigh the risks and choose to feed your pet whatever you believe will be most beneficial for your dog in the long run. If that happens to be chicken bones, feed them with care.